The Société de Distribution Aéroportuaire (SDA), a joint venture between Aéroports de Paris and Aelia (Lagardère Services), has chosen BrightSign and TMM Communication to implement its strategy for digital communication at BUY PARIS DUTY FREE, the retail brand created by SDA. 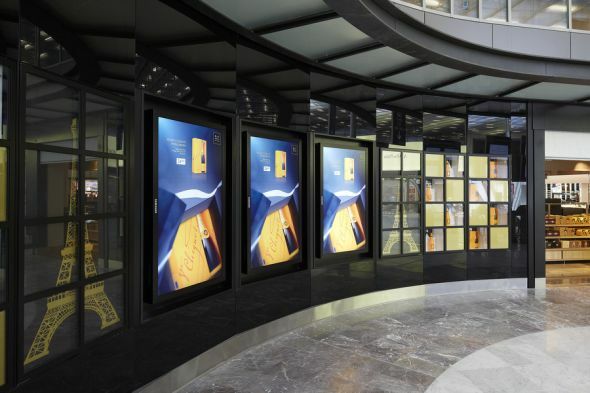 The flagship store at Charles de Gaulle airport in Paris opened March 27, 2012 and is equipped with seven double horizontal ceiling-mounted screens, and a wall of screens spanning 9 square meters. A second store opened June 28 in the new departure lounge of Terminal 2E at Charles de Gaulle, and was exclusively equipped with high-impact formats: a pair of display walls covering 14 square meters apiece, and a column comprised of 36 synchronized screens. The technical study, project management, content integration and installation of the digital signage solution was conducted by TMM Communication. The company selected BrightSign players because they offered the reliability to withstand the 24/7 nature of an airport setting, and the ability to synchronize HD video flawlessly, across multiple video walls. “BrightSign’s players deliver high-quality video content, perfectly synchronized to the 46- and 70-inch Samsung displays in massive video walls, as well as the architectural arrangement of 36 43-inch Hyundai screens situated in a circular column,” commented Michel Baronnier, President of TMM Communication. “This impressive installation truly captivates the attention of travelers as they make their way through the duty-free shopping area." Limited space behind screens and within video wall columns required a compact player with low heat emissions. Large displays required video content to be played at Full HD quality. The all-day, every-day nature of airport traffic required a reliable player that would run consistently 24/7. Many video walls required perfect synchronization of video files. BrightSign players allowed TMM to create a unique and technically complex installation showcasing the mastery of the company’s technological innovation. The video wall synchronization features Full HD video quality to attract customers into the store, and further, to engage them with the brands carried in-store.